218 733 W 14th Street - North Vancouver Apartment/Condo For Sale, 2 Bedrooms - Brandon Crichton, Personal Real Estate Corp.
Patio time! 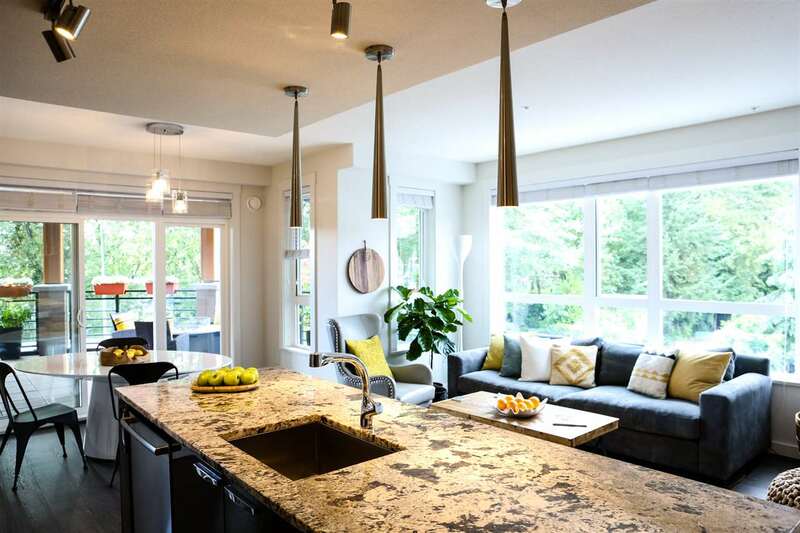 !This spectacular Showhome condo boasts a huge ,semi circular 400 sq.ft patio!The Ultimate kitchen upgrades includes All Bosch appliances, Granite countertop and backsplash, softclose drawers,all metallic cabinetry and Cyclone fan. Fantastic views of the Northshore mountains and Mosquito Creek are the perfect backdrop for this amazing home. This spacious two bedroom, 2 bathroom, and office offers an entertainer friendly floorplan with open concept living space and sizeable kitchen, living and dining room.It also features separated bedrooms, custom office built-ins in the den, and hardwood floors. Remix is located just steps to Harbourside park, Mosquito Creek, shopping, restaurants,seabus and highly anticpated Hawker's Wharf!Open House Sat 12-3.Sun 12-4.See you on the patio!